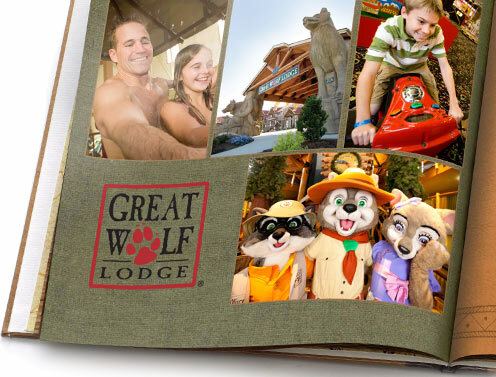 Shutterfly has partnered with Great Wolf Lodge to create an exclusive photo book design available only to guests of Great Wolf Lodge. Your 20-page, 8x8 hard cover photo book is valued at $29.99. If you prefer, you can pick out another Shutterfly photo book style. How do I get my free photo book? When you get to your room, look for a Shutterfly promotional card. It will be near a sample photo book. The card has a unique promo code to redeem your offer. After your stay, visit www.shutterfly.com/greatwolf and enter your promo code to get started. To get the exclusive Great Wolf Lodge style, you must enter Shutterfly via this page. Photo books are the easiest way to capture and share memories. From major milestones to everyday moments and everything in between, relive your favorite memories forever in a photo book.